We have talked about what t shirt yarn is and what you should look for when purchasing it. We have seen what other people are making with it. 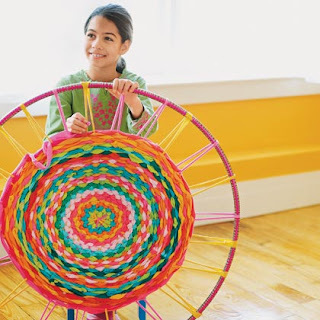 Now, it is time to give you some ideas so you can start making things with it too! Let the fun begin!! I found many tutorials for t-shirt yarn. It can be used in so many ways! These are a few of my favorites, and while I hope you try them out and enjoy them, I also hope that you will explore more ideas on your own. Google t-shirt yarn tutorials and you will have more projects than you know what to do with! Read the full tutorial by Nicole Blasenak Shapiro from Family Fun Magazine.! In this tutorial, they are using strips of t-shirts. It isn't actual t-shirt yarn, but this could easily be done with t-shirt yarn. Follow the instructions, just substitute t-shirt yarn. It will take longer to weave, but you will be able to fit more rows on for a tighter rug. Or, just use the t-shirt strips to recreate the bulky and fabulous look they have going on. Either way, it is still an eco friendly project that will leave you with a beautiful new rug! Find the pattern by Missy posted on So You Think You're Crafty. This one is for the knitters. It is a very simple pattern and great for beginners. I just love the look of this bag. The big advantage to using t-shirt yarn when making a bag is that it won't sag like traditional yarns do. I love cotton bags, but cotton yarn will go from your waist to your knees if you put anything in it, if you don't line it with some kind of fabric. Bags made with t-shirt yarn are bulkier and the yarn is already stretched so it shouldn't have a lot of give, and because of that it won't need a fabric liner. This bag should be able to hold the weight of all the produce you can carry home from the market with no sagging and you will look fabulous! Find the tutorial by "Ivory Soap" on the Little House in the Suburbs blog. 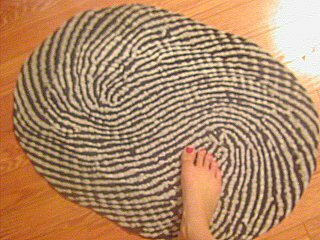 I love the look of this rug and it is super easy to make. I'm not sure how it would do in a washing machine. In the comments, Ivory Soap suggests making a pot holder using this technique and washing it a few times to see how it holds up. 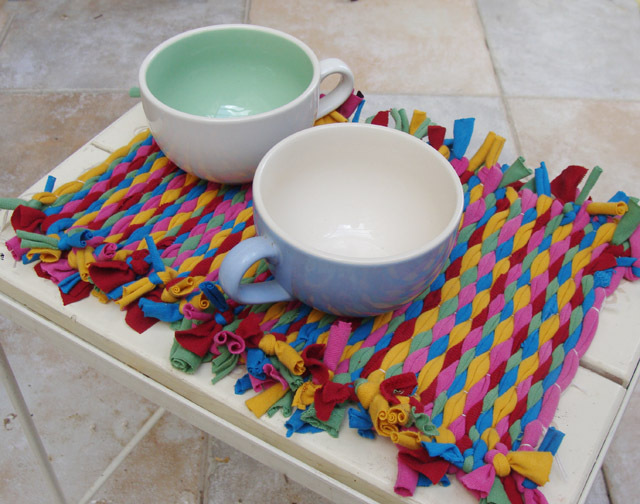 Although it is a no sew rug, if you wanted you could throw in a few stitches when you change strands to secure it for a spin in the washing machine. Totally up to you. Ivory Soap isn't exactly using t-shirt yarn, as she is using t shirt strips that have been kind of rolled and corded. T-shirt yarn will work well for this project though. Find the full tutorial on Creative Jewish Mom blog. I love this because it is so versatile! The loom is made from a piece of cardboard and some cotton string. It couldn't get more basic than that, right? You can make it as large or as small as you want. You can use this technique to make potholders, placemats, trivets, rugs, table runners, and whatever else you can think of! She has a couple of different ideas on how you can finish it. She finished this one by tying knots at the ends to secure it. You could also run it through a sewing machine to secure the ends and have a flat fringe to it. Or, if you are already at the sewing machine and really want to go all out, you could even sew on a border made from some t-shirt fabric scraps and really give it a clean looking finish. It's all up to your style. Find the pattern by My 9 Lives on the Instructables website. We covered knitting so I thought I would give a crochet pattern too. 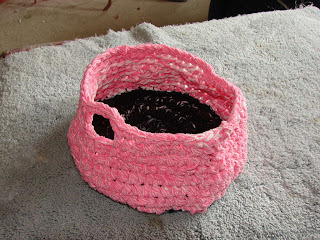 I love bowls made from t shirt yarn. Now this one is just a bit saggy looking, but I can tell you how to avoid that. First of all, she is working with just t shirt strips at the top that haven't been stretched on the sides. You can also see that she used a t-shirt with a side seam on it, which is a no no for making perfect t-shirt yarn. It won't be even with the seam in there. Only use actual t-shirt yarn that has been stretched into a cord. This will be more firm and will hold its shape much better than t shirt strips. The pattern should work up just fine. The instructions are super easy and excellent for a beginner. On several tutorials, I see people working with strips of t-shirts. On some projects this works well, and on others it doesn't. Remember that t-shirt yarn is corded by stretching a t-shirt strip. If you are just using t-shirt strips, you will run a strong risk of it being pulled and stretched later, creating a disaster to your project, as you will have a loop you won't be able to easily hide. I recommend just using t-shirt yarn or craft cords and not t shirt strips, but I also encourage creativity. If you like the look of the strips, and on the hula hoop rug they look great, I encourage throwing caution to the wind. You could also substitute strips of a bedsheet or flannel pants or other similar fabrics that are soft and won't stretch. This would be the best way to get a similar texture, without running the risk of a snag in your project later. I love the market bag! 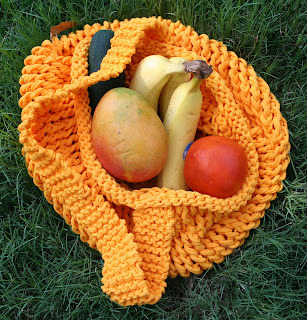 Good point that it will not stretch out of shape like other knitted bags! I may have to try that one out!